Image Size: 12 X 16.375 in. Recently artist Steve Hanks has been working on a series of paintings he refers to as “There are Angels Among Us” wherein he explores the idea of guardian angels in our lives. These may be angels of inspiration, angels of beauty, angels who provide direction or protection in our lives and the spirits of angels who lift us and sometimes even carry us. Mostly he is creating a tribute to the great role models and influences in his own life. Boundless has a compelling composition. 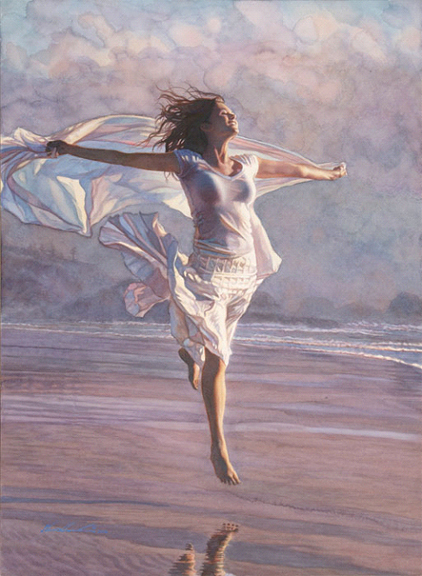 Her gesture like a metaphor for the cross, this joyous beauty leaps into a shaft of sunlight on an otherwise dim and foggy beach. Viewers are left to wonder, will she come down or is she on her way, eternally up? This very limited Fine Art Edition will bring inspiration to any room in your home and a gift of light to someone you love.